In mid-2014, the price of a barrel of crude oil topped $100 (about €94). Two years later, in mid-2016, the price stood right around $40 (€37.5), having bottomed out just above $30 (€28) per barrel at the beginning of 2016. That kind of dramatic price drop has oil and gas companies aiming to substantially improve efficiency and availability, putting urgency behind initiatives to achieve efficiencies by digitizing oil and gas operations, processes and functions. Oil and gas firms have long understood the importance of data to their business; it’s at the crux of efforts such as oil exploration and equipment monitoring. But given that oil fields tend to be in remote areas and harsh environments, including off-shore, it’s been a challenge to transfer the data to a data center where it can be thoroughly analyzed and mined for valuable information. For example, offshore platforms can generate more than a terabyte of data every day, but the satellite uplink is too slow to transfer all that data – so the operations teams on land can’t keep up with the available data. The drop in oil prices is increasing pressure to address such issues. Companies are responding by moving compute resources closer to their oil fields, even to offshore oil platforms, or increasing capacity where it already exists. In the process, oil and gas firms need to address the issues that harsh environmental conditions present, while addressing industry regulations around issues such as safety. Chief among the issues is the need for clean, reliable power, given that loss of power can cause supply interruptions, damage to facilities, breaches in security and large financial losses. That means they need UPS system solutions specifically designed to handle the type of harsh environmental conditions typical of the oil and gas industry. The systems must be able to function in a wide range of temperatures, both heat and cold, and withstand humidity, vibration and dust. Given the high cost of downtime in an oil and gas environment, the UPS systems must also be highly reliable, able to operate 24×7 for literally years. Along the same lines, they need to be simple to maintain. In order to make sense of all the data their various systems produce, the companies also need computing capacity. Rather than try to ship data to some far-away data center, oil and gas firms are now increasingly building them on site, even on offshore oil platforms and in harsh desert-like environments. As this previous post explains, the trend is to use prefabricated, modular components, which can be installed in a fraction of the time of stick-built facilities. Modules can address the exact requirements a company may have, whether it’s an entire data center or just additional power or cooling. They can be built to withstand the environmental challenges that the intended location presents, whether it’s salt water or excessive heat. The modules are also movable, housed in ISO containers that can be moved by truck, train or ship. Of course, oil and gas companies tend to be global in nature, so it’s important to find a supplier that can deliver on these requirements literally anywhere on the planet, as Schneider Electric can. 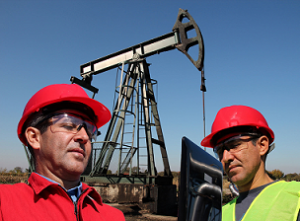 Explore more of our complete solutions for oil and gas by clicking here.